I just started a new image backup to a usb disk drive and Acronis True Image 2016 reports the operation is queued. How can that be, there are no other backups going on although sometimes it appears that Acronis is doing something in the background which I don't want. This is very annoying because I have other computers that need to be backed up and this one is stalling. Hello JV, normally as you have indicated, a queued operation would suggest that another operation is in progress. Have you setup either Nonstop or Sync for ATIH 2016? What does the Windows Task Manager show for active Acronis tasks / TrueImage tasks? Have you checked to see what activity is indicated in the Acronis log files - there will normally be a service_* log for an active backup task- look in C:\ProgramData\Acronis\TrueImageHome\Logs. Thanks for the comments. I have not setup a Nonstop or Sync for ATIH and the Windows10 task manager does not show any Acronis tasks. I looked for the log file but could not find one, there is no C:\ProgramData file on my computer. 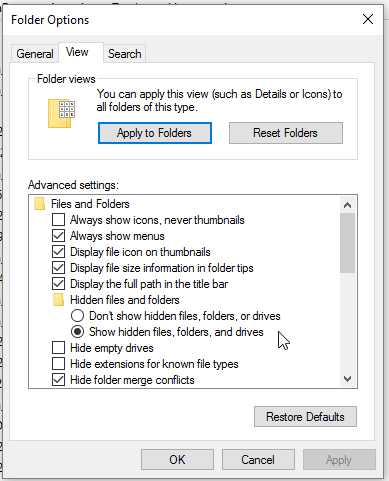 JV, the C:\ProgramData\Acronis\TrueImageHome\ folders are often hidden and you will need to change the Folder Options in Windows Explorer to Show hidden, files and drives in order to see it. 4) rename the folders C:\ProgramData\Acronis\TrueImageHome\Scripts and C:\ProgramData\Acronis\TrueImageHome\Database (e.g. ScriptsOld and DatabaseOld). Please note that ProgramData folder can be hidden on particular systems. 5) Start Acronis services anew and check if the application works as expected. You were right, ProgramData was a hidden file and the log files show that a continuous backup was going on and also a scheduled backup. I was not aware that I had initiated either. I ran the task zap command and deleted all tasks, don't know how to stop all Acronis services. There were no Acronis tasks shown in the task manager to bew terminated. Did not rename the folders, too lazy. Will restart Acronis next time I want to do a backup. Now, running other programs and waiting to see if any Acronis activity occurer. Thanks, I think we are making progress. To stop Acronis services, goto Win 10 Settings and do a search on "Services". One of the items displayed will be "View Local Services" . Click on that and it will bring up a list of services. Acronis services should be at or near the top of the list. Click on each Acronis service and you should get an option to stop. Services will restart at next boot up or when starting ATI. I had a power outage on the backup network drive at the scheduled backup time for 2018. Once power was restored and the drive's network connection verified, the status had gone to queued, and then just sat there. There was nothing in the log showing a running process. I did a Stop then a Backup Now, and it is running normally. This suggests that whatever is looking to go from queued to running is not working properly.